Today as I dropped off another van-load of rescued golden retrievers at the Homeward Bound Golden Retriever Sanctuary, I saw a family in tears. Mother, Father, daughter and son. I didn’t need to ask – I knew why they were there. It happens all too often. Job goes, house goes, family goes, and no place left for the dog. At least this family did the right thing. They brought their beloved pet to a shelter where it will be well taken care of and a new family will be found. When I found this old photograph of my friend’s son and his dog, it made me think of that boy today, red-eyed and crushed, and I wrote the poem for all those kids out there, and all their much-loved pets. Beautiful poem…and completely heartbreaking. I’m glad that family did the right thing for their beloved dog, but I can only imagine how painful that was for them all. Thanks, Talon. It only just hit me – that family gave up their dog on 9-11. Another reason not to forget the courage it takes to give up our lives or those of the pets we love, in order to ensure others live. 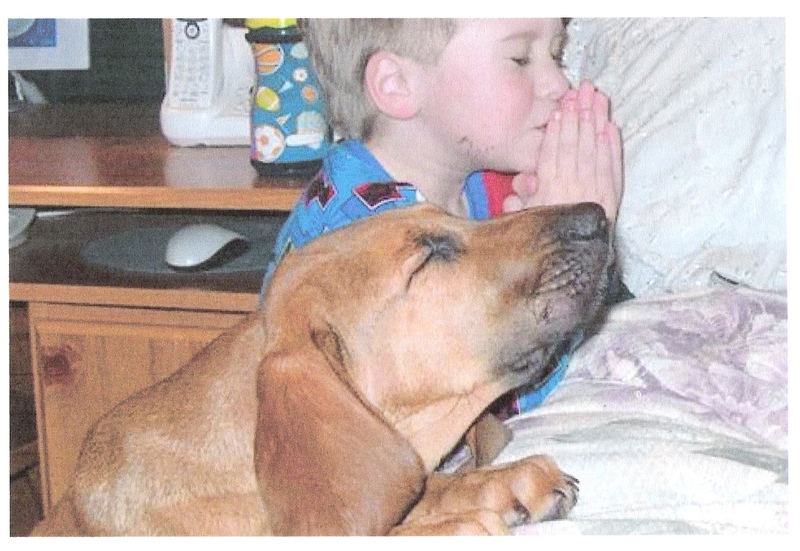 For that boy, giving up his dog was a tragedy – perhaps the first time he experienced grief. And yes, he did do the right thing. Good poem. I like the humour, pathos and humanity you display in this and the other work you have posted. Thank you Paul. Your kind comment is very much appreciated. That’s so sad… a breaking family is one of worst that one can see/face/experience! A lovely poem expressing that sentiment, Cindy.. Thank you so much, Amanda. I’m excited to join potluck and be amongst so many outstanding people and gifted, enthusiastic writers. Oh, this made me sad and opened my eyes, just a bit. No, more than a bit. Eyeopening is good, and often the truth hurts. We as poets need to keep our eyes and ears and all senses open, for we can turn these into words, and words can heal or make things begin to change. Thanks for passing this dish for the potluck! Thank you for your heartfelt comments. I love the photo and the poem pulled at my heart strings. Lovely job. Such a sad poem. You really do an excellent job of showing how important our animal friends are to us. Nicely done. Thanks, Teresa, both for the kind comment and the easy link to your lovely site. this piece made me cry. i have a pet dog named heaven (because that was how i felt when i first set eyes on him) and 3 lovely kids. i can’t imagine a household without all of them. What a wonderful way to name your dog – If I did the same, I’d have to name mine Grateful, because that’s how she makes me feel every day. Thank you so much for your lovely comment. Sorry about the tears! tis is sweet- brings us all down to reality..
Oh that was so good. You captured the perspective of a child in an incredible manner. I just found out about a competition that you should definitely consider. It needs to be original, not yet posted or published and twenty lines long. I am sure you could come up with a follow up to this great poem as an entry. I may just enter as well. Thanks, Joyce! I loved your latest recipe and story. I look forward to trying it out soon. simple tale, sadly and plainly told, the whole feel of the confidentiality and openness of the prayer of a child’s heart. and with the lack of mawkishness or sugar coated fake sentimentality often associated with this type of piece you have made this as real a depiction of what goes on in the poor kids heart as i could hope for. Wow, when I wrote the poem, I had tears in my eyes, and when I read it to my sweetheart, he got tears in his eyes; now as I read your kind comments, tears visit my eyes again. How lovely a thing is writing, making eyes shine.